The ability to speak the English language with all its proper pronunciation nuances forms the backdrop of teaching in English Lab. Based on the "Wordsworth" syllabus designed to enhance English Learning among students, the topics are relevant, interesting and the concepts are age-related. The exercises include speaking, listening, comprehension, vocabulary and writing of English, which enables the students to enrich their language skills in an enjoyable, interesting and simple manner. What is a computer and how relevant is it in our lives? Questions such as these are part of the previous century. Today, computers are everywhere. In the lab, apart from the history of computers, students learn to work on the computers. This involves understanding and writing language and code, learning creative and technical tasks, hands-on projects and creation of power points. One of the pure-science subjects, Math's is either hated or loved; more often the former. Most students find it non-stimulating, rigid and boring. Not any more. With the introduction of the Math Lab, learning has become fun. Centered around hands-on activities and solving real-life practical problems, the lab provides an opportunity to understand, internalize, discover and verify the basic mathematical and geometrical concepts through concrete objects and situations. It makes the subject easier and helps in better understanding of the concepts. The importance of art to a society can never be explained adequately. Art not only helps to develop the brain but also cultivates important skills that are beneficial for a child's development. The use of colours, shapes and figures, helps the children interact with the world around them and aids in self-expression and communication. 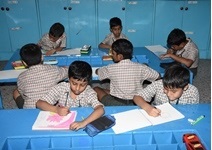 We have a creatively furnished art room where children explore the world of colours, making fun. 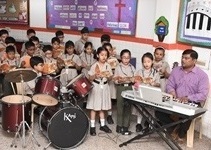 At Mount Carmel we believe that music forms an integral part of life and hence cannot be left out of the human experience. 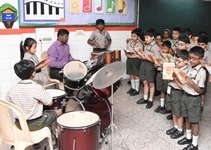 Children listen and learn new songs, sing, clap and dance. Knowing that the music score is truly the only real international language, we want each child to know the basics of reading music, and playing the scales on more than one musical instrument. Our school choir is recognized as one of the best in the city. What the football field is to an older child, the toy room is to the preschooler. They love to play with the beautiful soft toys, puzzles, colourful blocks, kitchen sets and building blocks. 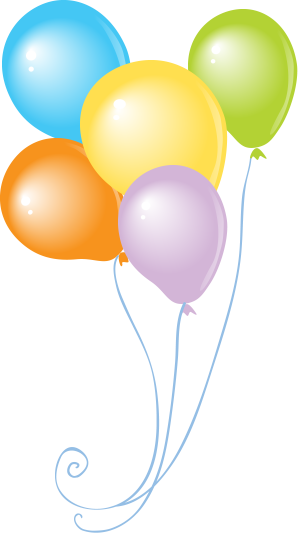 It is here that a child learns to develop basic social skills, teamwork and sharing. Perhaps, one of the most important rooms in any school, the library provides an opportunity for children to enjoy the world of the written word. From books on history to tent making and igloo dwelling, it opens an imaginary portal like no other tool can. For our students who have difficulty in reading, audio-visual aids are provided. We also have a large collection of books and novels in Braille. 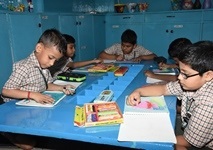 Apart from the library period, books are allotted to all classes, wherein the children get the opportunity to read on a daily basis after finishing their classwork. 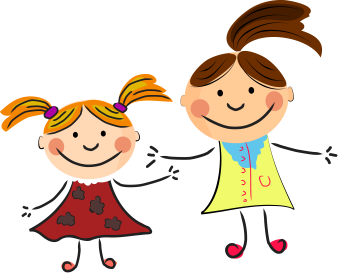 We also organize special events for children, such as story telling, just a minute (talk show) and many more activities related to the library's services and resources. The Counselling department offers psychological counselling for all students. Our counselors provide personal and group counseling on all working days. The school counsellor is in touch with the students and the parents from the Orientation day till the end of the academic year. Special education is a haven for students with learning and physical challenges. 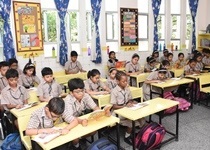 The junior school has a trained special educator who, with the help of teachers, identifies students with special needs, assesses their abilities and understands their specific strengths. 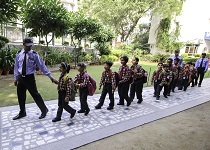 A remedial programme is chalked out based on the special needs of the children. 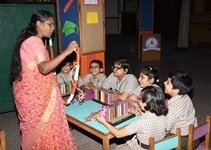 Under the inclusive model students who are differently abled benefit from additional educational services. 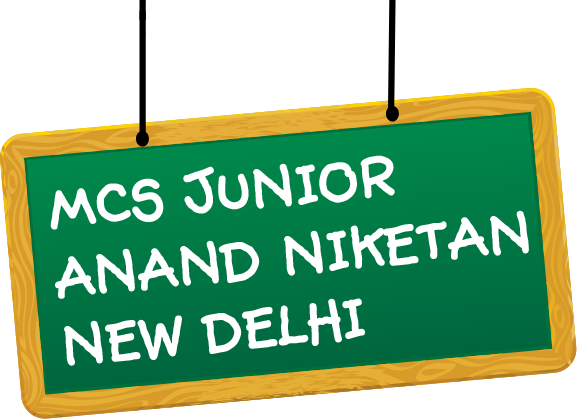 Junior wing has a well-equipped, air-conditioned wellness centre. The centre is equipped with double bed, refrigerator, nebulizer, steamer, BP instrument, oxygen cylinder and other emergency paraphernalia along with medicines and a first aid kit. A complete medical check-up is conducted annually for all students, while twice a year, measurements of height and weight are conducted. MCS also has a very efficient and disciplined fleet of school transport. Our fleet consists of thirteen buses (School owned and contracted), eleven of them big buses and two mini buses for the Junior wing. The bus fleet has experienced drivers and conductors that meet more than just the basic criterion. Knowing the importance of safety, guards are posted in all the buses. 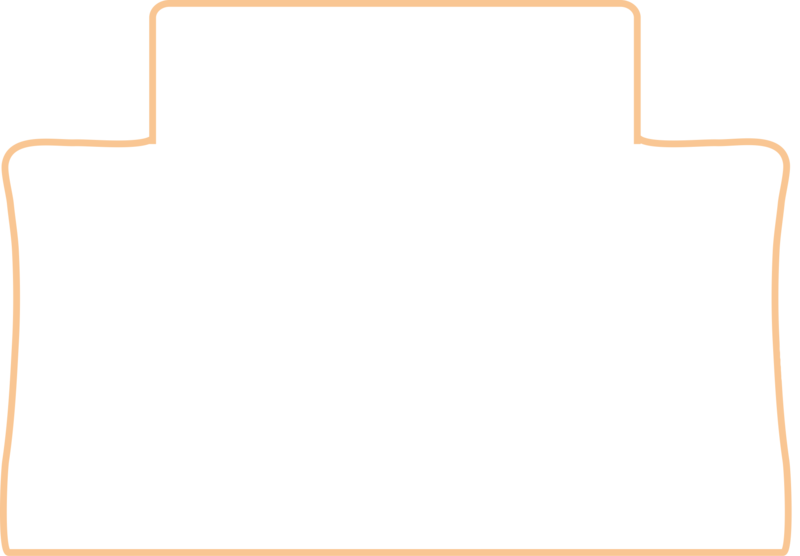 Dwarka - Janakpuri, Vikaspuri - Naraina, Lodhi Road - Inderpuri, Sarojini Nagar - Connaught Place Some parts of Hari Nagar, Tilak Nagar, Rajouri Garden, Subhash Nagar, Outer Ring Road and Kirti Nagar are also covered. The duck pool could be an ideal place to get relief from the heat as well as to break the monotony of classroom activities. 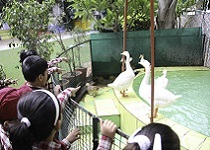 Besides giving children an opportunity to benefit from being in close vicinity with nature, it could also give them a good chance to observe the ducks from close quarters and gain firsthand knowledge about various aspects of these birds, thus arousing their curiosity and fostering further learning and interest. Love and care for animals and our surroundings is imbibed and encouraged. 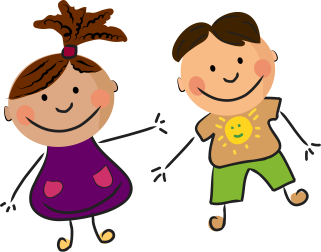 Playing and enjoying together with peers would also enhance social interaction. Sand is a great medium for budding artistic inclinations of children. 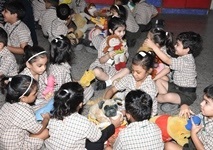 Sandbox activities are a hit among Nursery students. The teacher draws patterns and lines in the sand with sticks or fingers and invites the children to do the same. It's easy to make space for as much drawing as the child wants to do-- just smooth the sand over and it's a blank canvas again. 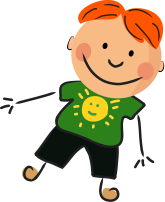 Besides, this activity enables children to be outdoors and enjoy and benefit from being out in the open. It helps to break the monotony of indoor classroom lessons. 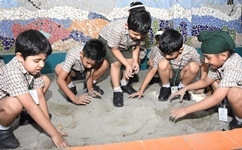 Handling sand, playing with it and exploring its many possibilities also improves their learning along with helping to develop their finer motor skills. 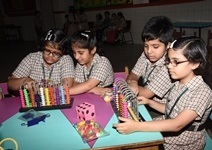 Playing and learning together with peers is an effective method to develop social skills as well.